A wonderfully designed and perfectly laid out hotel comprising of two restored Georgian houses. 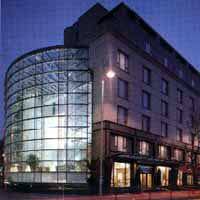 The Stephens Green Hotel is a popular and a much sought after establishment. The hotel offers state of the art accommodation, combined with scrumptious food and friendly service. The ideal location and high standards make this a perfect hotel for the business, leisure or shopping guest. The hotel offers 75 beautifully fitted en suite executive rooms and suites. The rooms sport a nice warm design which will ensure that each guest will experience a calm peaceful sleep. The rooms come with every facility necessary for comfort and convenience. Facilities include air conditioning, satellite television and movies, three direct dial telephones, integrated pc modems, voice mail, iron, ironing board, trouser press and sewing kit, continental and US electrical sockets, hairdryer, tea and coffee making facilities, welcome trays and mini bars. A full 24-hour room service is also available. The business centre has seven state of the art meeting rooms. So if it is shopping, sightseeing, business or just a need for pampering and a well earned rest this is the ideal hotel for you. The Magic Glasses Bar is very popular and a light menu is available daily in the bar and atrium consisting of salads and gourmet sandwiches. The Pie Dish restaurant which opens for breakfast, lunch and dinner offers an a la carte menu with modern European cuisine. All dishes are prepared and presented to the highest international standards in keeping with the excellent reputation of this great hotel. The hotel is ideally located on St Stephens Green and a stroll though the Green is a balm for a weary mind and body. A tiny walk will bring the guest to Grafton Street for great shopping and a wonderful atmosphere created by a wide variety of buskers. The National Gallery, The Natural History Museum, Dail Eireann are all close by. As is Trinity College the oldest university in Ireland and home to the Book of Kells and the Old Library.